Oak has been used in fine furniture for years and makes for beautiful cabinetry. Oak ranges in color from white to pink and reddish tones. Streaks of green, yellow and even black may appear due to mineral deposits in the wood. 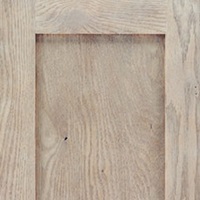 Grain characteristics of oak cabinets may include random wormholes, knots and wild, varying grain patterns that can showcase fine lines, pin stripes, leafy grains and watery figures, creating the distinct graining many homeowners consider a desirable quality in oak cabinets. Red oak cabinets feature a wood grain that is characterized by prominent straight lines, arches and points. The wood's variations are more noticeable when used with lighter finishes. Red oak cabinets stain evenly. Rustic versions of red oak cabinets have intense color, select knotholes and more radical graining.